The 清朝Qing (Manchu) Dynasty (1644-1911) was China's last dynasty. The Manchus were Mongol-like horsemen turned merchants from Manchuria. They were of mixed Mongolian, Korean, Chinese and Jurchen stock. The Manchus sucessfully expanded the Chinese Qing empire far into Central and Southeast Asia and managed to bring Tibet and Mongolia under Chinese control through a system of buffer states. The Manchu success was attributed to their ability to marry Mongol military technique with Chinese administrative government. For around 18 centuries, China's geographical position was protected in all directions by a system of buffer states. The aim was to carefully administer and rule a “China territorial core” (which roughly hadn't changed territorially since China's first unification under the Qin emperor in 221 BC) and then surround this with a group of buffer states or territories, ruled through different forms of agreements. This system granted security, trade and served to expand Chinese imperial virtue to the outside world. In the 17th century the 清朝Qing dynasty conquered China, taking over the Ming Dynasty. At the same time Russian encroachment started into the once deserted and loosely controlled Siberia. The Russians started thinking of Siberia in terms of the European state, that is they wanted clear, limited frontier positions, not loosely ruled, buffer zones. This led to a series of treaties and wars marking the borders between Qing China and Russia for over two centuries, by which Russia took large parts of Siberia's frozen desert. In the 19th and 20th centuries, the buffer states were increasingly encroached upon from all sides. While the Russians were coming from the north, the British were coming from the sea and from the south. The first opium war came in 1839-42, which led China to accept different rules of trade and administration of foreign merchants working in China, and in 1939-42 the first British-Afghan war saw British forces reaching the south west frontier of one territory which was loosely under China control - Tibet. In the same period the French conquered Indochina, a buffer state of the Qing dynasty, and the Japanese rejected Chinese patronage and conquered Korea, also a part of the Qing empire. The Qing dynasty eventually collapsed in 1911. But encroachment by foreign powers on all the sides of the Chinese border changed China's perception of its own territory and of the use of buffer states. Today the concept of buffer states for security and trade with Central Asia and other surrounding countries is no longer relevant. Instead Mongolia and other former buffer states in Central Asia are now the subject of intense commercial interest due to their immense mineral resouces and proximity to China. Mongolia has some of the largest coal mineral resources in the world as well as immense reserves of copper, gold and uranium. China's national energy strategy is currently focused on securing increasingly scarce resources while diversifying away from the western world. Hence China is investing heavily in mineral resources from Mongolia. Since 2003, it has invested around $500m in FDI in Mongolia. This is because much of Mongolia's coal is the high-quality “coking” variety vital to steel production and it is located only 145km from the Chinese border. Interestingly, China now produces 50pc of the world's steel. Hence Mongolian coal is set to become a cornerstone of Chinese energy policy that will fuel Chinese economic growth in the 21st century. 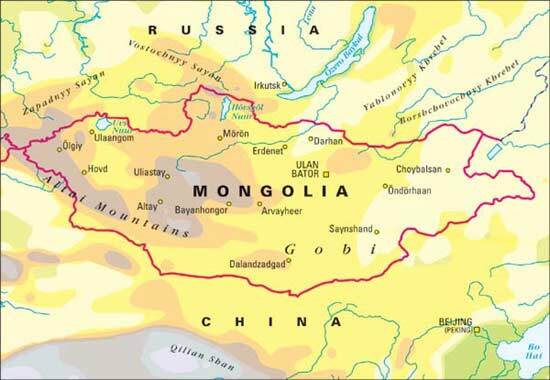 Mongolia and other Central Asian States have long been intertwined with Chinese history and its system of "buffer state" territorial control. But today, China's investment in this former buffer zone, where a third of Mongolians are still nomadic or semi-nomadic in the 21st century, is beginning to open it up to the outside world. A further development is the beginning of a new wave of commercial relations between China and Russia that the US is unable to compete with. So far, it appears, in the 21st century, that neither China nor Russia sees Central Asia as its exclusive domain. In Mongolia, both Russia and China are treading carefully. Russia's influence in Central Asia combined with Chinese investment cash, together, is working to transform what were fragile buffer states into a transit corridor based on trade in energy and minerals. The Geo-Trade Blog believes that it is highly possible that this could give rise to trade in a whole range of goods and services in a flourishing new trading corridor through the former Central Asian buffer states which the European bloc countries could also tap into due to their geographical proximity. It is here where economic power is being exerted and the shape of the world in the 21st century is beginning to emerge.